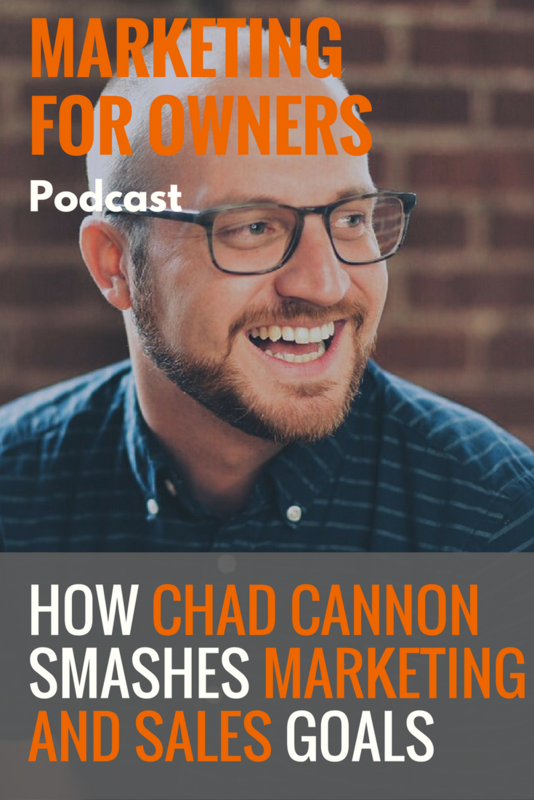 Chad Cannon is Chief Marketing Officer at Michael Hyatt. However, they first met at Thomas Nelson Book Publishers, where Michael was CEO and about to launch his book Platform, and Chad the VP of Marketing. In fact, Platform was the first book which Chad worked on the marketing of, where he had to figure out a marketing plan on his first day, with just 45 days until the publishing date. It went on to become a New York Times Bestseller. During his five years at Thomas Nelson Book Publishers, he worked on 25 bestsellers and saw it transition from the old model of marketing to social media, email, and other things everyone else had been doing for at least 10 years previously. But when the clients he worked with kept expressing their desire to work with him through his own agency to help market their whole brand, it seemed like an opportunity he couldn’t ignore. Over the next two years, he grew his agency into a success. But having grown too fast, and feeling like he was losing sight of what was important, he went to work for Michael Hyatt full-time, where he is leading a great team towards an exciting vision. Find out how Chad achieved the success he has, and how he makes sure he’s going to carry succeeding to hit the goals they set at Michael Hyatt to ensure they keep on growing. After two years of running his own agency, it has grown significantly thanks to having clients eager to work with him from day one. In fact, Michael Hyatt was one of those clients. They were thriving and the team consisted of six people. It had grown to a seven-figure agency, with healthy margins. But having grown too fast, Chad was working 60 to 80 hours per week, leaving him exhausted and meaning he wasn’t always present with his wife and friends. He didn’t like the person he was becoming, and as he was about to adopt a baby daughter with his wife, he needed to reassess what was really important. Closing the doors on his agency was tough. But by going to work with Michael, he didn’t feel he was giving up his entrepreneurial spark, as he still has freedom, and is still using his marketing skills and leadership qualities. Having worked with him for two years beforehand, Chad knew that Michael really trusts his leaders, and was excited for what was coming. He knew what he was getting himself into. By focusing on the marketing on behalf his behalf, Michael is now free to focus on the other areas of the business, thanks to delegation. That way, they have grown faster and better, and in line with the five-year plan they have in place. Their goal is to go from helping tens of thousands of people to transform themselves using the books and frameworks, to helping hundreds of thousands – and potentially millions over the next decade. Michael Hyatt’s business all grew from his book Platform and led to the creation of the Platform University. This now forms just one part of the segmented business. Overall, there are four segments: influence, leadership, productivity, and personal development. Everything they do has to fall into one of those categories, and within the product track which forms each one. Chad is a numbers guy, and not only markets on intuition, but is also driven by numbers. At Michael Hyatt, they are looking at blog visits and revenue every day as part of the overall goal. But to achieve that five-year plan, they use lead measures within the business. Heavily influenced by The Four Disciplines of Execution by Sean Covey, they set WIGs (Widely Important Goals) and have weekly commitments. If you hit those lead measures, then you’ll ultimately hit the annual goals, which could be to grow your revenue or the blog views. In order to achieve more views, they set lead measures to be able to take the steps which go in that direction. These can consist of leads per day, dollar per lead, and dollars per acquisition. By measuring these frequently, they can then react to any abnormal changes, and they know they’re going to hit their target, rather than just blindly hoping. With the Michael Hyatt business, they are currently working towards a business model based on reoccurring revenue, rather than the current one which is based on launches. This isn’t something that is going to happen overnight, but it will ultimately be more healthy and sustainable, rather than the highs and lows which they presently experience with the business. This can be stressful for those involved, especially with the number of products which they’re now offering. As a result, they don’t have the time to make the launches as good as they’d like them to be. But launches are still a very effective way of running a business. Although some people are now starting to distance themselves from such models for business, there will always be people who choose to stick with it. You may start to see a trend of businesses experimenting with both, as they try to figure out which is best for them. After all, every business is unique. Chad believes that there is no real distinction between marketing and sales, particularly at Michael Hyatt. Copy is written with a purpose in mind, whether that is to build authority and trust, or is intending to persuade the reader to do something. Marketing is everything that is outward facing to consumers which says something about the brand, meaning it pretty much encompasses everything. Sales are done on a one-to-one basis and are transactional, as you’re looking for the customer to do something directly. When it comes to sales, you’ll probably get an early indicator when chatting with someone on whether or not you’re going to close a sale. But that conversation is still a useful one if you do sales well, as you instead warm them to buying the product next time. It’s far better to take a longer-term view that they’ll become a customer further down the line, rather than risk losing them for a short term gain. And that is a mindset which is also useful in marketing as you don’t want to be spamming potential customers until they finally buy from you. All of the marketing which they do is currently online, but that is now beginning to change as Chad is building a sales teams at Michael Hyatt, specifically for the higher-priced products which they will sell to their current customers, giving them a one-on-one connection. This is a concept which they have already proven to be effective, and are now in the process of building the infrastructure in order to facilitate it. In order to call their current customers, they obviously need their phone numbers. And they have been collecting this data from their customers, instead of only getting their email addresses. And they’ve done this in a number of ways. With their webinars, they use them not only for opt-ins but also as a sales launcher. And with it, they have been collecting phone numbers in order to send people SMS reminders of the launch. Even though it isn’t mandatory as part of the process, they collect around 40% of people’s numbers. And another advantage is that it has increased the show-up rate to the webinars. When they conduct surveys, at the end they ask for phone numbers just in case they want to talk to the person further about their experience with the brand. Again, this isn’t mandatory, but by telling people what they can expect (that they might get a phone call and it won’t be used for spam), people are more willing to give their phone number. And even when people sign up for the Platform University and their other products, after the transaction is complete, they’ll then ask for more information about them. It is the book Ask by Ryan Levesque, and his other products, which have shaped the way in which they’re doing this. A ton of effort goes into producing all of the products, and it is a common value of the brand to create a ‘wow’ factor. It is engrained into everything they do, at all levels of the business. But they also don’t allow themselves to be put off releasing something just because something isn’t as ‘wow’ as they would like it. Things can always be ‘wower’, and the next version will always be better. At Michael Hyatt, they are creating a brand based on a personality. And of the world’s top 100 leading brands, around 80 of them started life as personalities, many of which you’ll recognize from fashion. Ultimately, they’re creating a Michael Hyatt brand which is well known and will last long after he has stopped being involved in the business – if that ever happens anyway. At the Michael Hyatt website, there are loads of helpful resources, freebies, and reports to be had. Blog posts are released three times and week, and even a weekly podcast which, even though it is currently on hiatus, is still has increasing listener numbers thanks to its timeless content. And also check out the range of products they have available, from books to software, and courses to membership programs. You’re bound to find something useful.